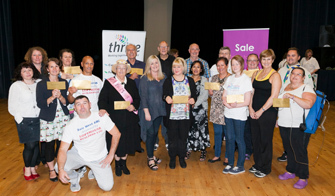 On Saturday 6th September, Sale residents turned out in force to Sale Waterside Arts Centre to have their say on £20,000 of community funding. The ‘Have Your Say’ public voting event hosted by Sale Locality Partnership and Thrive Trafford attracted over 350 local people, making it the biggest of five public voting events held so far this year to allocate funding. Each group hosted a stall which showcased their project, with displays ranging from young boxing champions to songs from Trafford Carers Choir. The funding was made available through Trafford Council’s Voluntary Sector Grants scheme, which supports the development of projects that improve local communities. The nine projects which were successful in receiving funding were Hi Tension Workouts – “Fitness For Body and Mind”, Sale District Scout and Guide Band, Friends of Ashton Park, New Way Forward, Trafford Carers Centre, Confidence after Cancer, Sale Arts Trail, Sale West Amateur Boxing Club and Manor Court Social Group. Please see below summaries of all the shortlisted projects. In addition to those groups funded through the grant scheme, an added bonus came from the Sale and Altrincham branches of Skipton Building Society, who were so impressed with the fantastic work of community arts project, Birds of Paradise Arts that they pledged a donation of £500 to enable the project to continue. Manor Court Social Group baked cakes especially for the event, and raised £100 through donations which they are gifting to Macmillan Cancer. Our aim is to continue to provide a “Fitness for Body and Mind “class to all those within our community with mental, physical and learning disabilities. We also aim to empower adults who feel isolated and lonely. Due to the success of this group, and the current sessions being full in the Urmston area, our new aim is to launch a “Fitness for Body and Mind” session is Sale. We have had enquiries from residents in the area about the sessions. The sessions will run every week in a local Sale venue, that is accessible, and on main bus routes for the local community. We will address within the class, develop and improve physical and mental health amongst all those whom attend. We are a newly re-form Scout and Guide Band based on the edge of the Council Estate in Ashton on Mersey (M33 5HF), open to non-members as well as current members of the Scout and Guide movement and also to children who play a musical instrument and those who have never played a note before. We aim to encourage their musical skills and confidence and to build pride in themselves and their own abilities to try something new. Our aim is to build up a band whose members are mainly aged 9 – 25 years old, from all walks of life who will perform as part of the band in local parades and carnivals and hopefully compete in band competitions all over the country. We currently charge a £2 per week subscription which we hope will be affordable to most people for a 90 minute music lesson, with the funding we hope to purchase a range of instruments which can be loaned out to members for a minimal fee (£1 a week) and once the price of the instrument has been covered it is theirs to keep. Our group is aimed at women who have completed cancer treatment/s. Depression, anxiety and lack of confidence is common amongst those who have had cancer. It is shocking to learn that breast cancer survivors are 37 percent more likely to commit suicide than other women, this elevated risk persists for at least 25 years after diagnosis. We provide individual, group coaching and support to enable women to rebuild their lives and look forward to a happy future. We will provide weekly group coaching sessions, starting in October in Sale consisting of meetings, where we will support women to work on their own recovery plan to wellbeing. They will set their own goals, which typically may be: returning to work, changing their job, volunteering, losing weight, improving fitness levels, taking responsibility for their own health and wellbeing, improving their diet, doing more exercise, joining community groups. Funds are needed for staffing costs, room hires, equipment (workbooks and CDs), also posters will be printed to ensure as many local people as possible are aware of the courses. Manor High is a community special school for boys and girls aged 11 to 18 years of age, who have statements of Special Educational Needs (SEN) because of moderate learning difficulties. In addition to their learning difficulties, about 40 per cent of pupils have significant emotional, behavioral and social difficulties. Manor High School pupils would like to set up a window cleaning and gardening company after school staff are willing to give their time for free for the project, however we do not have the necessary tools / equipment for the job and to give the pupils the best choice of employability skills we require funding support to obtain these tools and equipment. There would be approx 25 pupils involved in the project each year. Once we have the equipment there would be no need for additional funding as the project will be self-funding. The project will be based at Manor High School and will start to offer services to community groups in the Sale M33 5JX area and neighbours to the school that we already have a good relationship with. We are the friends of Ashton Park who are volunteering to maintain and enhance the park for the benefit of the whole community. We are a small group of 6 volunteers and have organised an annual picnic with over a thousand visitors. Through talking to the visitors at the picnic, we understand we have a willing community who tell us they would be happy to do some practical tasks. They just need someone to pull them together and to organise some activities! Love your Park; Volunteering days; Second Saturday of the month; Weeding, cutting back, painting and planting are the main tasks, plus we would like to organise a free healthy snack for the volunteers as a reward. We will arrange for some of the jobs the Council can no longer manage to be completed by volunteers to boost the park and raise the standard of the environment. Birds of Paradise provide a range of arts activities and projects for children, young people and families to support mental health and wellbeing. Activities are tailor made to suit the needs of individuals or groups and aim to provide a fun, educational and health focused approach delivered in a supportive way. Birds of Paradise have developed a community based arts programme in Sale West, which supports the whole family. The Cherished programme provides a pathway to learn new skills, improve the mental health and well-being of children, young people and families along-side offering opportunities to develop individual skills through volunteering and/or work placements. New Way Forward is a mental health project based in Sale, Cheshire. The organisation has service users who come to us from throughout the Trafford area and can either be referred by other organisations or self-refer. We are looking for funding for a woman group and a men’s group as each will have different interests. The groups will promote social inclusion as well as be a focal point for service users to build up their living skills and confidence. It will also give some respite to carers. To provide bespoke training opportunities to disabled, sensory impaired and learning disabled people of all ages in participatory, arts based, community projects. Each workshop will explore co-ordination, body awareness, developmental movement principles, using a range of approaches, and using props such as mats and gymnastic balls. Sessions will progress to more complex spatial and dimensional movement tasks with individual and group focus. We propose a 10 week drop in, to encourage commitment for the remaining sessions. Lets Go Global is a creative media organisation, working across Trafford and Greater Manchester. We want everybody to be able to develop the skills to have an active and creative role in their own community to improve their employability, and life chances. We have been delivering creative and media projects with Sale West since 2003. We want to find ways to raise the profile of the group and encourage an inclusive community for those with learning difficulties. With this funding we will deliver 6 sessions, from September – December 2014, which will take place during the regular weekly Phab club activity sessions. Activities within the sessions will focus on enhancement of presentation skills, growth in creative imagination and building character awareness, as well as the technical skills to record, edit and broadcast audio. Sessions will be open to up to 15 members of the club, with a further three volunteers and staff from Phab club. That way they can also develop the skills and carry on the activity after the six sessions have been delivered. This would include regular monthly podcasts, recorded by participants, uploading online; enabling a continuous refresh of radio broadcast experience and an updated community status. The main aim of Trafford Carers Centre is that we promote a society in which carers recognise their own needs, achieve their aspirations, and are fully understood, valued and supported in their chosen caring role. Over the last 12 months we have been running a Carers Choir for our Carers based in Sale. The Choir is aimed at providing support for carers by enabling regular respite from caring, providing a community activity that will provide a social and support network group, enable carers to have regular access to up to date support information and knowledge on how to access further skills, whether they be life skills or education. The Carers Choir will enable Trafford Carers Centre to access more carers and ensure that carers acquire life skills based around personal care such as their overall health and well-being. The Choir will also enable them to be part of a “Community Learning” project with huge benefits for individuals and the caring community. Skillz FC is a community run FA Charter Standard Club running coaching sessions in a range of sports, allowing people of all ages in the community to learn new skills and have fun. We use the latest FA Youth Award Coaching methods, working on player ownership to develop self-esteem, confidence and skills to manage mistakes. We provide these activities at low cost for the community. All Skillz FC coaches are from our local community; our training is fun, current and sized to allow total inclusion and maximum participation for anyone taking part. Skillz FC aims to provide 2 holiday clubs running at the October half term (5 days) and Easter (8 days). These will provide enjoyable and organised football sessions, as well as other games and sports that are structured for children aged 5-16 and delivered by FA qualified and licensed coaches in a safe environment. The programme will also allow Skillz FC to further develop and train 2 – 3 young coaches who currently volunteer a lot of time to help run the different programmes that Skillz currently provide in the community. Sale West Community Urban Trust (SWCUT) was established in 2010 as a charity to relieve the needs of children, families and carers with a view to improving their physical, mental, emotional and spiritual capabilities so that they grow to full maturity as individuals and their conditions of life are improved. SWCUT are active members of Sale West & Ashton Partnership (SWAP), working alongside statutory agencies, local organisations and local people to build better connections between residents, resulting in a sense of community pride. Successful SWAP projects have been achieved through the hard work of volunteer members working with partners. Urban Explorers are a group of local parent volunteers who have come together to share their interests and knowledge of the natural environment and all who live in it. They have taken the lead of a natural history programme for children aged 6 – 11 years, where parents, carers and other family members are also encouraged to take part and become interested in their environment. The programme, entitled The Monsters Guide to Survival is planned to take place each Friday from 4 – 5.30pm during winter and spring term (2015) in Sale West Community Centre large hall. Ski. We have been operating from Sale Water Park for 28+ years. We are open to non-members and we offer the cheapest access to water – skiing and wakeboarding in the UK. This bid is to purchase some wet suits and life jackets in a range of sizes so that visitors can ‘have a go’ in reasonable gear without having to purchase their own straight away. This makes it really accessible for families, even those with a number of children. We would also like to purchase an inflatable stretcher as an additional safety precaution as our existing one’s now very old and out of date. In 2014 we organised our first event to high public and artistic praise, over the weekend of the 11-13th July we opened The Waterside Arts Centre, 4 local cafes and 6 local artist’s studios to the public. Over this weekend more than 250 people came to the preview at the Waterside on the Friday night and more than 600 came to the artist’s studios and cafes around Sale on the Saturday and Sunday. The three organisers of the Sale Arts Trail are looking to organise our second Art Trail in Sale connecting local musicians, poets, artists and makers with each other and with the local business and residential community. We are targeting this event at Sale residents of all ages who are interested in the arts. We will bring these groups together through a group show of all artists and makers to be held at Sale Waterside followed by an Art Trail showcasing the talent of the local creatives through the opening of their usually secret and hidden home art studios. Our project will showcase and attract more people into Sale Town Centre. The event is presented on a map that leads people around Sale, bringing people into the town centre and including as many local businesses as possible. We provide preschool education to children aged 2 ½ to starting school – open to all in the community. We will refurbish the toilet facilities at our venue. This project will benefit all members of the toddler and playgroups. In addition, we share the premises with the Sale Scout group and so this will benefit them too. Finally, fundraising events and the hire of the building for parties etc. mean that families within the local community will also benefit from the refurbishment. At present, there are no child height toilets or sinks and no baby change facilities. In addition, the current toilets are at least 25 years old and they are in poor condition. Babies are currently changed on a change mat on the floor. We provide a service to over 60s living in assisted housing and local area, including social activities and help. At present Trafford Housing Trust are modernising our communal lounge- we need some items which they are not supplying to help us go forward with our aims. We would like a music centre so that we can have afternoon tea, some games or a dartboard for a games afternoon. For the opening of the new lounge we would like a singer for our special afternoon tea.